Shortly after upgrading to Microsoft Office 2007 I ran across this nice FREE add-on from Microsoft which allows you to save your documents in the Adobe PDF or Microsoft XPS format using all eight Microsoft Office 2007 applications. I use the feature almost daily so I’m sure all you groovyReaders will appreciate the find! Fill out the PDF or XPS options and your Done! #1 – XPS is Microsoft’s version of PDF. 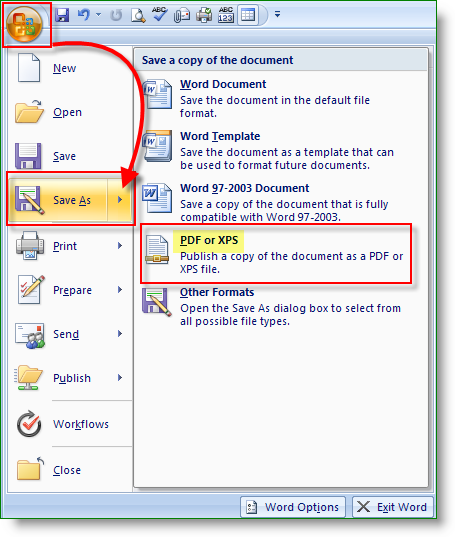 #2 – It allows you to save and share a document with people who might not have Word installed. 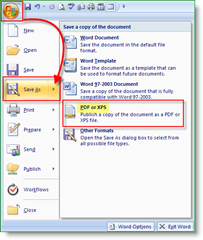 #3 – It allows you to share documents with people however they cannot change the document. Perhaps you want to send a contract to someone or a Bid for a job or???? Saving it as a .XPS they won’t be able to modify (normally). Like I said, it was supposed to be the PDF killer but it never really took off. In the past Microsoft was releasing all their documentation and White Papers in .PDF AND .XPS form however recently I’ve noticed they seldom use .XPS anymore on their websites. Thanks for that, I realize that in the first instance it does not show but when you go further to where you save up comes all the choices. when i apply and open microsoft account then error was occured.